Did you all have a lovely weekend? Drinks at a local restaurant across from my apartment; The Butcher and the Boar. Check out the pork chop my friend Brendan order! Derek and I are taking my sister there for dinner on Friday! A Birthday celebration on Lake Minnetonka for my lovely friend Britt! Always good to see old friends! A delicious brunch with Derek's family sunday morning before church (I seriously love an early Sunday Brunch before church)! 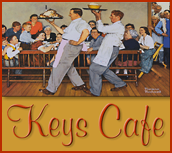 Keys Cafe has some of the best Cinnamon Bread! It was a full weekend, but a fun weekend! And now I believe I owe you some new recipes for this week! I have had this chicken marinading all night! And since the evenings have been getting cool in Minnesota, I thought I would make a big pot of this vegetarian chilli! Three bean vegetarian chili to be exact! Are your evenings starting to get cool where you live? Are you ready for fall to be here? I know I am, I am jsut ready for the new wardrobe!